photo - Ladies Dressing Room on a Flying Boat, upload feito originalmente por Jassy-50. The Solent has two decks. Entrance is on the lower deck, and the first thing you see upon entering is a small bar, aka the “Cocktail Lounge”. Passenger seats are to the right of the bar and also to the front and to the rear of it. 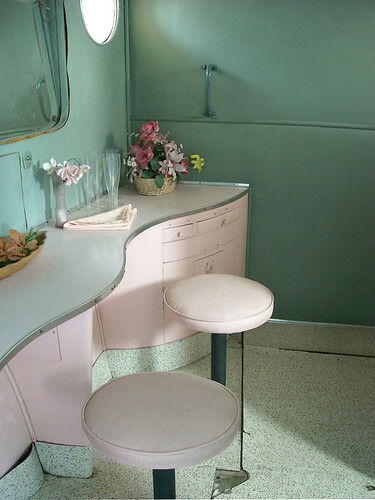 The Ladies Dressing Room is at the rear of the plane (very glam and very large by today’s airline standards), with the Gents’ toward the front (not glam and not large). A steep and narrow stairway takes one to the upper deck (very like the modern 747), which contains more passenger seats, the galley and the cockpit. The Museum’s Solent was a cast member in the movie “Raiders of the Lost Ark”. You can sit in the seat that Harrison Ford occupied in the movie (it is the one that is the dirtiest and most worn out because everyone wants to sit in it, :-D).